NEW! 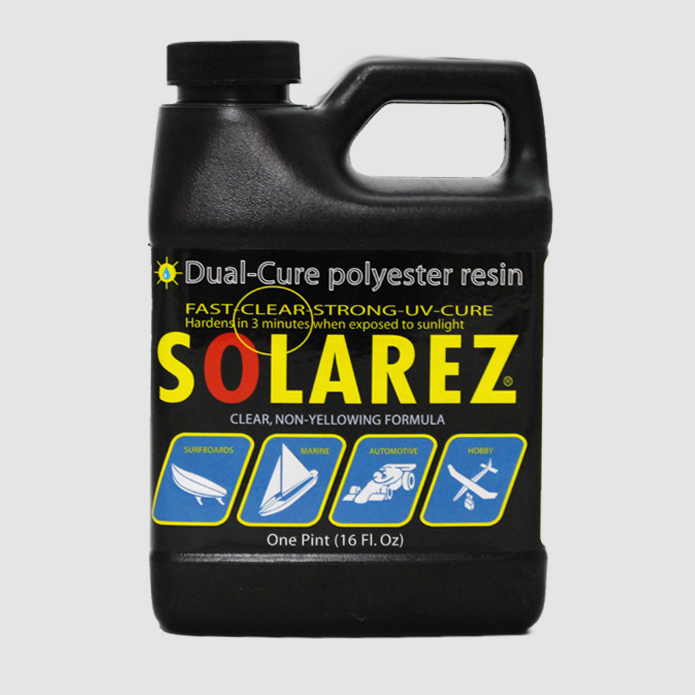 LOW-VOC Clear “Dual-Cure” Polyester Resin. Cures by either UV-light or by addition of MEKP catalyst. Water-clear, UV-stable, and cures with a bone-dry surface. This low odor, low VOC polyester resin will certainly be welcomed by garage laminators (and their neighbors). This resin has much less smell than regular polyester. There is no compromise in any of the physical characteristics. Love this stuff, as it works just like the description and instructions says it does. 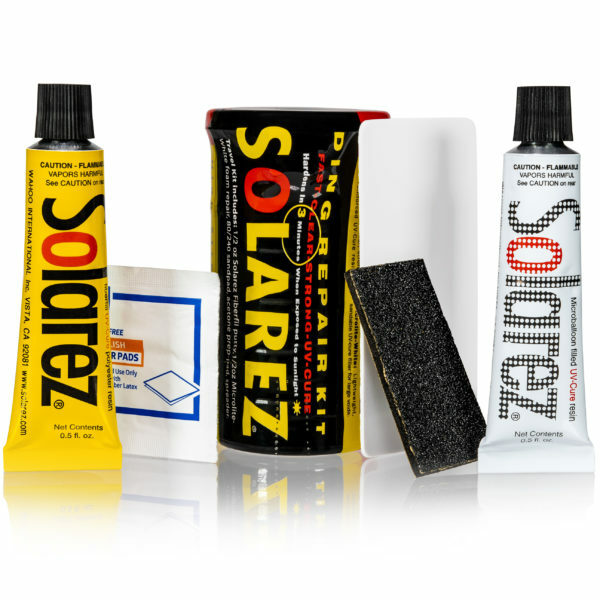 And with the video how to’s out there, most amateurs can produce decent surfboard repairs, thanks to the controlled curing process of Solarez. very forgiving. long working time if needed. good option of dual cure. I have never had a problem. Thanks E-Duck. I’ve used this a number of times now and used a UV flashlight to start the cure. It works great. The smell is terrible, but if you are used to Polyester Resin that will be nothing new. The one downside to the UV cure is that you can’t open it outside during the daytime in order to let the smell dissipate. Truly can’t say enough about this product, it’s awesome. I’ve glassed three surfboards with it, and every time it cures clear and hard which is great to work with! This is the only product I will glass a surfboard with. I just bought another gallon two days ago! I used this resin to glass a couple of yellow cedar rudder blanks for my racing sailboat model. worked great for the glassing, but when I went to put a finish coat on, I got orange peel, After sanding, I covered the uncured resin with mylar. 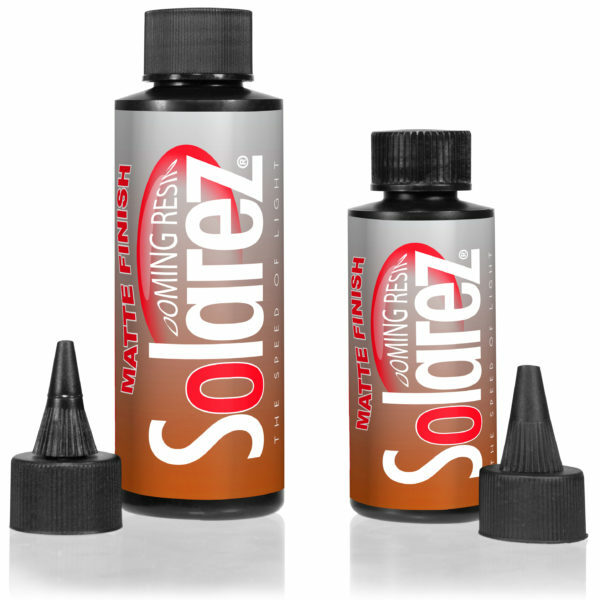 If one is careful to avoid bubbles, this produces a very smooth finish within a minute out in the sun. I was able to go straight to 3M Finess it for polish. Great to have all the time in the world to work in the shade with the uncured resin. Produces a very hard surface. 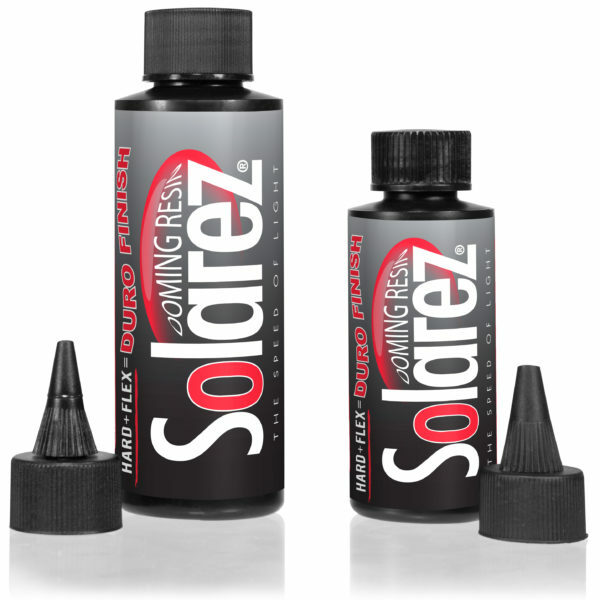 I’ve been using Solarez for almost 3 years now. I use it exclusively for making earrings for my business. Works great. Having a catalyst to make sure the resin hardens where the sun won’t meet is the most important part for me. Great for repairing my surfboards up in Maine. I’ve tried a lot of different UV finishes. This is one of the best. The kicker is the customer service. I’m a Solarez guy now.